Gary Dicker and Tony Sweeney are among the players told they could leave the club in May. 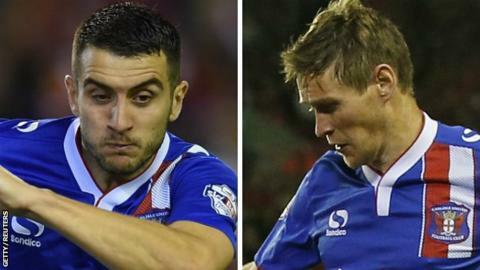 Carlisle manager Keith Curle says there is no rush to take Gary Dicker and Antony Sweeney off the transfer list following their recent improved form. Sweeney, 32, scored in Tuesday's win against Leyton Orient, while Dicker, 29, has played 12 games, despite his dispute with the club last term. Both players were among a number told they could leave in May. "Any player in the last year of their contract is on the transfer list," Curle told BBC Radio Cumbria. "They're good professionals, buying into what we're trying to do and we've got a very strong squad. "Don't be surprised if players who've played 90 minutes tonight might not be involved on Saturday." Victory returned Carlisle to winning ways after a disappointing loss at home to Newport County last weekend, a blip in a month where the Cumbrians took Liverpool to penalties and won three of five league games. "The squad is developing into a team with a team mentality," Curle added. "There were players who played tonight who didn't play on Saturday. "I don't owe the players anything my job is to pick a team that gets results and wins."